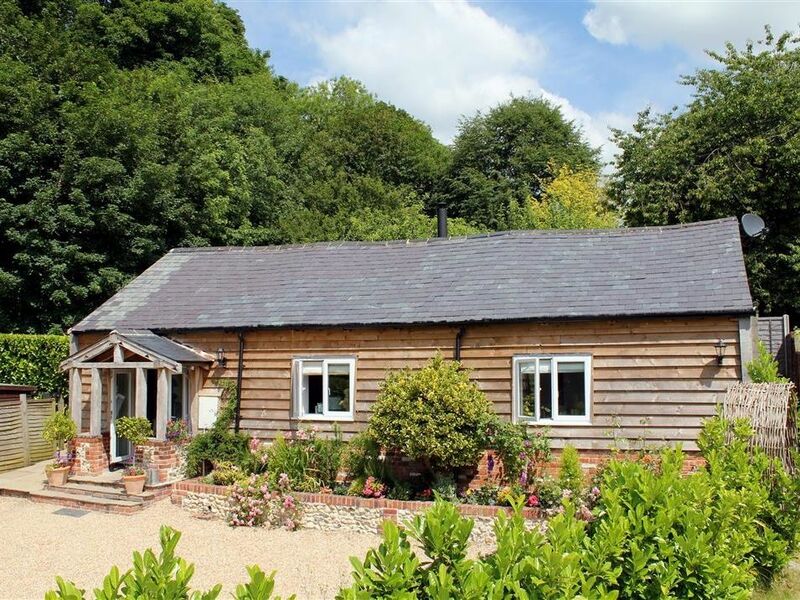 Shafts Barn is a converted barn house situated in West Meon, Hampshire. It stands 50 metres from the owner’s 15th century cottage. There is one king-size bedroom with an en suite and one twin bedroom with an en suite. It has a living room with a wood burning stove, a fitted kitchen and dining area which has French doors that lead to the garden. Outside is a private garden with a paved seating area with a barbecue and children’s sandpit provided. Off street parking is available. Shafts Barn is excellent for a small family or two couples. Amenities: Central heating with wood burning stove. Electric oven and hob, microwave, fridge, freezer, washing machine, tumble dryer, dishwasher, TV, WiFi. Fuel and power inc. in rent. Bed linen and towels inc. in rent. Off road parking. Enclosed lawned garden with paved area, sitting area, furniture, children's sandpit and toys. Sorry, no pets and no smoking. Shop and pub 4 mins walk. Town: This converted barn house is siuated in West Meon, Hampshire. The surrounding area has opportunities for walking and cycling on the South Downs Way and the disused Meon Valley railway. The cathedral cities of Winchester and Chichester are less than an hour’s drive away. For a market town, visit Petersfield or venture a few minutes’ walk from the property to find the local village store, café and butcher, as well as the Thomas Lord pub. Central heating with wood burning stove. Electric oven and hob, microwave, fridge, freezer, washing machine, tumble dryer, dishwasher, TV, WiFi. Fuel and power inc. in rent. Bed linen and towels inc. in rent. Off road parking. Enclosed lawned garden with paved area, sitting area, furniture, children's sandpit and toys. Sorry, no pets and no smoking. Shop and pub 4 mins walk.